Look, we know everyone's been complaining about the length of the Hobbit trilogy ever since the decision to make the adaptation into 3 separate movies. And they were right to! But now we have actual statistics to show that they're some of the most gratuitous book-to-movie adaptations ever. Data blog FiveThirtyEight took the unenviable task of analysing 54 book-to-movie adaptations from 2000 onward, seeing how many minutes of film were committed to how many pages of books (in the case of books that received multiple films, this was figured out by finding the last chapter of the book adapted in each respective film as the cut off point) - and the Hobbit Trilogy came out as the worst movies for overstretching the source material. Insert your 'butter scraped over too much bread' joke here. 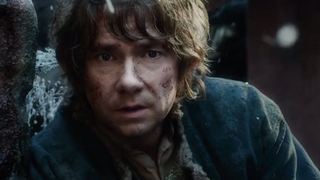 The Battle Of The Five Armies topped the list of egregious adaptations with 144 minutes of film adapted from roughly 72 pages, to come in at a ratio of 2 minutes per page - followed by An Unexpected Journey (1.69 minutes per page) and then The Desolation Of Smaug (1.33 minutes per page) - and they were very much the pack leaders as the fourth most egregious movie, Baz Luhrmann's Great Gatsby adaptation, only had a minutes per page rating of 0.79. Turns out some of the least egregious adaptations were some of the Bourne movies, a handful of Harry Potters, and some of the Twilight films. Although it's by no means conclusive - a handful of sentences can easily describe something that takes minutes to play out on film, regardless of the old 'a picture paints a thousand words' chestnut - it's still a pretty thorough look at how stretched some adaptations can get. So there you have it - when you're preparing your complaints for this year's inevitable Extended Edition trilogy box sets of the Hobbit saga, you'll at least have some Maths on your side. Check out the full list of 54 movies at the link below.